On Wednesdaynight, Feb. 20, for the third time in the past year, the moon will becomecompletely immersed in the Earth's shadow, resulting in a total lunar eclipse. As is the casewith all lunareclipses, the region of visibility will encompass more than half of ourplanet. Nearly a billion people in the Western Hemisphere, more than 1.5 billionin Europe and Africa, and perhaps another half-billion in western Asia will beable to watch ? weather permitting ? as the brilliant mid-winter full moonbecomes a shadow of its former self and morphs into a glowing coppery ball. Almosteveryone in the Americas and Western Europe will have a beautiful view of thiseclipse if bad weather doesn't spoil the show. The moon will be high in a darkevening sky as viewed from most of the United States and Canada while most people are still awake and about. The onlyproblematic area will be along the Oregon and northern California coast, wherethe first partial stage of the eclipse will already be under way when the moonrises and the sun sets on Wednesday evening. But if you have an open view lowto the east, even this situation will only add to the drama, for as twilightfades, these far-Westerners will see the shadow-bitten moon coming into starkview low above the landscape. And by late twilight observers will have a fineview of the totally eclipsed lunar diskglowing red and dim low in the eastern sky. Alaskans willalso see the moon rise during the eclipse; in fact, much of western Alaska will see the moon rise while completely immersed in the Earth's shadow. For Hawaiians,moonrise unfortunately comes just after the end of totality, with the moongradually ascending the sky and its gradual emergence from the shadow readilyvisible. Western Europeand Africa also will get a good view of the eclipse, but at a less convenienttime: before dawn on Thursday morning, Feb. 21. Moreover, thiseclipsecomes with a rare bonus. The planet Saturn (magnitude +0.2) and the brightbluish star, Regulus (magnitude +1.4) will form a broad triangle with the moon'sruddy disk. Carefulwatchers will notice the moon changing its position with respect to the starand planet as it moves eastward through the Earth's shadow. Saturn'sposition will also depend somewhat on your location. Seen from North America, the great ringed planet will be 3.5 degrees above and to the left of the moon'scenter at mid-totality (3:26 Universal time February 21st). At the same moment,Regulus will sit just 2.8 degrees above and to the right of the moon. Some old-timeastronomy buffs may remember from 40 years ago a total lunar eclipse with the moonsitting only about a degree from Spica — a gorgeous celestial tableau! Morerecently, in 1996, a totally eclipsed moon passed within 2 degrees of Saturn. But thisupcoming double event will be the only one of its kind occurring within thenext millennium! There isnothing complicated about how to view this celestial spectacle. Unlike aneclipse of the sun, which necessitates special viewing precautions in order toavoid eye damage, an eclipse of the moonis perfectly safe to watch. All you'll need to watch are your eyes, butbinoculars or a telescope will give a much nicer view. L= 0: Very darkeclipse, moon almost invisible, especially in mid-totality. L= 1: Dark eclipse,gray or brownish coloration, details distinguishable only with difficulty. L= 2: Deep red orrust-colored eclipse, with a very dark central part in the shadow, and outeredge of the umbra relatively bright. L= 3: Brick redeclipse, usually with a bright or yellow rim to the shadow. L= 4: Very brightcopper-red or orange eclipse, with a bluish very bright shadow rim. Examine the moonat mid-totality and also near the beginning and end of totality to get animpression of both the inner and outer umbra. Atmid-totality, the darkness of the sky is very impressive. Faint stars, whichwere completely washed-out by the brilliant moonlight prior to the eclipse,become visible and the surrounding landscape takes on a somber hue. As totalityends, the eastern edge of the moon begins to emerge from the umbra, and thesequence of events repeats in reverse order until the spectacle is over. Unlessairborne volcanic aerosols or other unusual atmospheric effects influence itsappearance, the moon's disk should appear moderately bright, especially rightaround the beginning and end of totality. The lower part of the moon willlikely appear brightest and glowing a ruddyor coppery hue, while the upper half of the moon should look more gray orchocolate in color. The eclipsewill begin when the moon enters the faint outer portion, or penumbra of theEarth's shadow. The penumbra, however, is all but invisible to the eye untilthe moon becomes deeply immersed in it. Sharp-eyed viewers may get their firstglimpse of the penumbra as a delicate shading on the left part of the moon'sdisk about 20 minutes before the start of the partial eclipse (when the roundedge of the central shadow or umbra, first touches the moon's left edge). Duringthe partial eclipse, the penumbra should be readily visible as a dusky borderto the dark umbral shadow. The moon willenter Earth's much darker umbral shadow at 1:43 on Feb. 21 by Greenwich orUniversal time, which is 8:43 p.m. on Feb. 20 in the Eastern time zone, 7:43p.m. Central time, 6:43 p.m. Mountain time and 5:43 p.m. Pacific time. Seventy-eightminutes later the moon is entirely within the shadow, and sails on within itfor 51 minutes (about average for a total lunar eclipse), until it begins tofind its way out at the lower left (southeastern) edge. The moon becompletely free of the umbra by 9:09 p.m. Pacific time or 12:09 a.m. (Feb. 21)Eastern time. The vaguershading of the inner penumbra can continue to be readily detected for perhapsanother 20 minutes or so after the end of umbral eclipse. Thus, the wholeexperience ends toward 12:30 a.m. for the East (with the re-brightened moon nowsloping down along the high arc it describes across the sky), or during themid-evening hours for the West. ? For Europe and Africa, the mid-point of this eclipse occurs roughly between midnight and dawnon the morning of Feb. 21, and as such the moon will still be well placed in thewestern sky. At the moment of mid-totality (3:26 UT), the moonwill stand directly overhead from a point in the Atlantic Ocean roughly severalhundred miles to the northeast of the coast of Suriname. 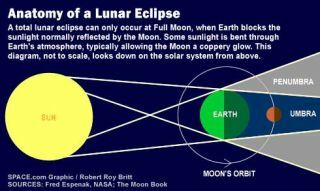 There will bea partial eclipse of the moon that will be visible across much of Europe and Asia on the night of Aug. 16-17. About 81 percent of the moon's diameter will becomeimmersed in the umbra, leaving only the upper part of the moon visible. In 2009, therewill be four lunar eclipses, one a slight partial and the three others whichwill be of the penumbral variety meaning that at best only a vague hint of alight shading or smudginess on the moon's disk might be detected — if anythingat all. But not untilDec. 21, 2010 will there be another total lunar eclipse; that one too willagain favor the Americas. So althoughwe've had a veritable plethora of total eclipses of late, keep in mind thatafter next Wednesday, you'll have to wait almost three years until your nextchance to see another.